all fairly standard however there are simple ways to ensure you avoid these reactions altogether! A common and natural side effect of waxing is redness and inflammation. Now, to a degree there will always be some redness particularly with people with pale and sensitive skin. Hairs are literally being ripped out from the follicles; that’s always going to cause the skin to react in some way. However using a superior wax, with high quality ingredients is going to decrease the reactions and cause much less irritation to the skin. Cheap, inferior wax, made with poor quality products is the main cause of irritation. Usually we are told “natural” is better but when it comes to pine (tree) resin in waxes, unrefined resins can cause allergic reactions and product instability. Top of the range synthetic resins are much safer, more consistent in production batch to batch and trust worthy product. Synthetic resins are usually declared as hydrocarbon resin or polycyclopentadiene. High quality synthetic resins are easy to colour and fragrance and often appear fresh and clean. Pure white waxes can only be made from the best synthetic resins available. Waxaway pride ourselves on providing high quality products made with the finest ingredients, ensuring our customers can trust and feel confident in their chosen product. When you have finished your waxing routine use Waxaway’s After Care Lotion. The smell of the lotion – Mango and Witch Hazel, is absolutely delicious but even more important, it contains soothing properties which calm and replenish the skin with vital nutrients. The lotion will help with soothing the skin post waxing and will also help prevent the formation of ingrown hairs and pustules. Ingrown hairs and pimples are extremely common after waxing, however are easily preventable and treated. Using Waxaway After Waxing Lotion will remove any sticky wax residue that is left on your skin. It contains Tea Tree Oil which works as an anti-bacterial, helping to prevent ingrown hairs and bacteria from causing pustules and pimples. It is easily absorbed and doesn’t leave the skin greasy so you’re left with a clean, smooth finish. Bump eRaiser Concentrated Serum is best used after waxing as the natural fruit acids soothe irritated skin and will help prevent ingrown hairs from occurring. To combat existing ingrown hairs you need a targeted spot treatment. 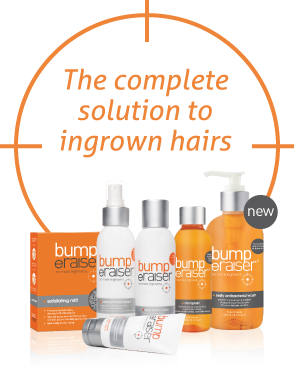 Bump eRaiser Medi Paste is ideal for healing ingrown hairs quickly and can also be used on pimples as it rapidly draws out the infection. Exfoliate daily, especially within the first couple of weeks after you’ve waxed as the hairs start to grow back – after all, prevention is always better than a cure! We all know that waxing doesn’t tickle however there are ways to make it a less painful experience. Using an incorrect waxing technique can cause serious damage to your skin including unnecessary pain and bruising. Get to know your wax. Practice in smaller areas first and follow the instructions that come with your chosen product. Always apply the wax or the strip in the direction of hair growth and then remove is in the opposite direction of hair growth. Remove as close to the skin as possible to ensure you are pulling the hairs from the roots and not snapping them at the surface. Practice makes perfect and our easy to use products with have you become a waxing pro in no time!